There are approximately 2700 international students and scholars from over 100 countries currently attending the University of Delaware. Our goal is to enhance international spirit and diversity through our programs and services. We strive to achieve success in promoting international education in our academic community in order that our students, scholars and dependents have a successful and enjoyable stay in Newark! 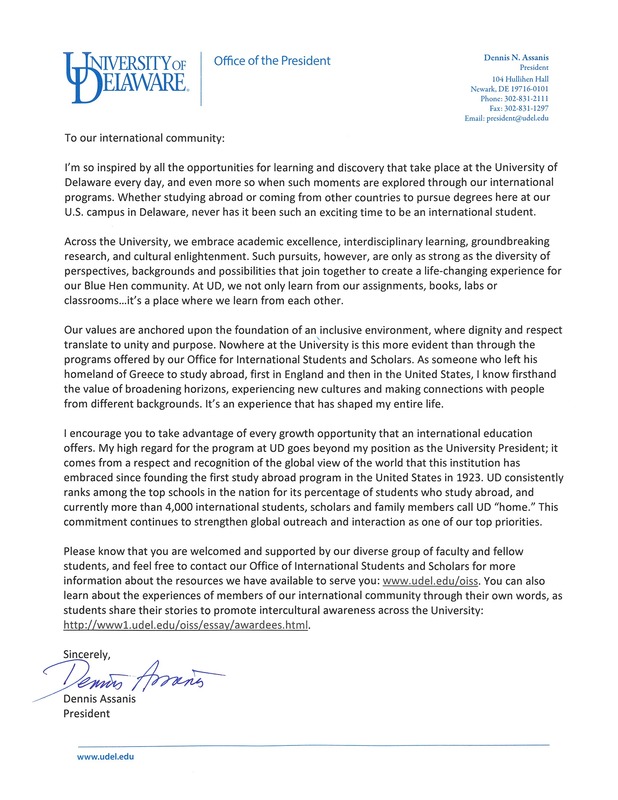 Letter from UD President Dennis Assanis to the international community. 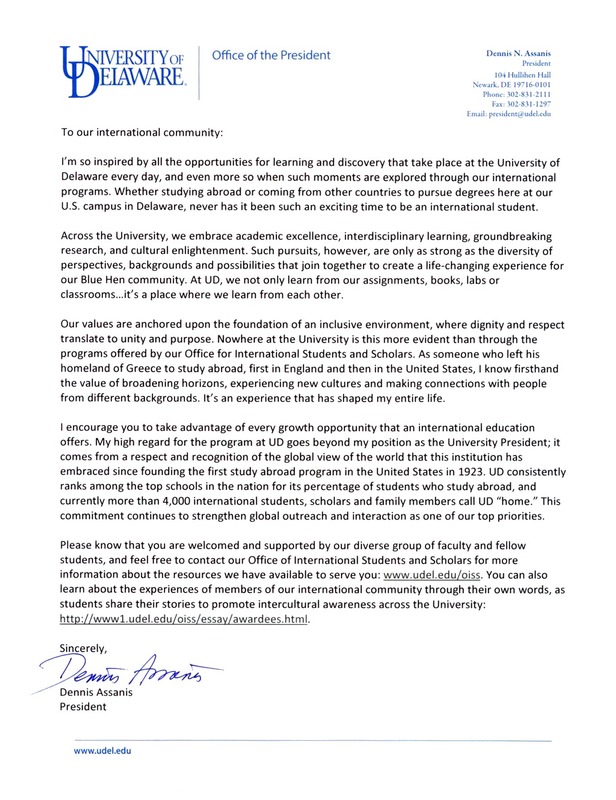 January 30, 2017 Letter from UD President Dennis Assanis to the international community. Applicants to a University of Delaware graduate program must possess (or be in the final year of completing) a U.S. equivalent bachelor’s degree. All Resumes, Personal Statements, Writing Samples, Recommendations and Supplemental Documents are expected to be submitted in English. Do not mail transcripts / certificates / diplomas – or any other paper document – during the application stage. Create a single scan for each degree earned. The single scan should contain transcripts / certificate / diploma for each degree earned. If available, please also include the grading scale page from the back of the transcript. Do not include any coursework earned at the high school level (typically before the age of 17). Do not include non-academic credentials such as “first place in business school.” This is not considered an academic transcript and should not be loaded into the degrees earned area. There should be no single scan / pdf larger than 7 pages. Do not scan using high resolution. If the scan is too dark or otherwise illegible, the time needed to contact you for a more legible scan will significantly delay the review of your application. If you have followed all these guidelines, but still have difficulty with your upload, see Frequently Asked Question #7. Our graduate application now contains an International GPA calculator that will convert individual course grades to an overall U.S. equivalent GPA. You will be able to access this calculator on the “College Education History” page of the application under “International Institutions.” Select the country where the degree was earned, and if available select the appropriate grading scale from the drop-down box.The entry fields of the GPA calculator are intended for you to list the course, the credits or hours the course was worth, and the grade received. After you have filled out the form, click “Calculate GPA” and a table will appear to the right of the form with your converted grades and GPA. You should then take a screen shot of the page and upload the image to the appropriate field in the application. If you prefer to calculate your GPA with a manual conversion table, please e-mail your university title and location to gradadmissions@udel.edu and we will send you the appropriate chart for your use. Other frequently asked questions about the graduate application process can be found throughout this page, and also on our Frequently Asked Questions webpage. 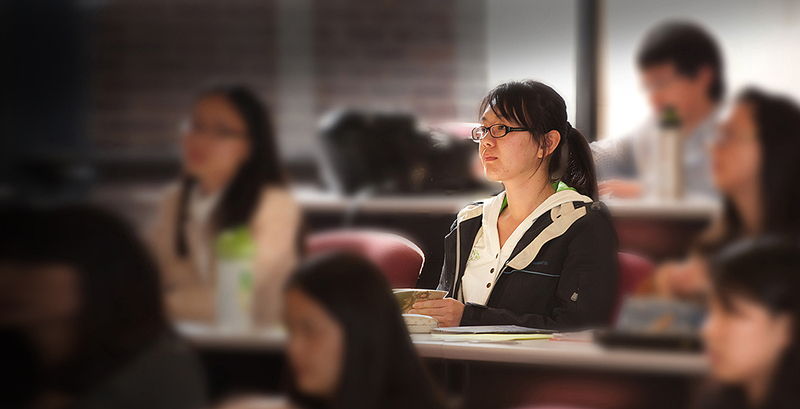 Each graduate program reviews their own applicants at varying times. The graduate department informs the central office of their decisions, and the central office checks only for University level policy compliance. When the decision has been processed you will receive an e-mail letting you know a decision letter has been posted to your application status page. Upon logging into your application status page you will see a new link called “Your application decision is now available online.” When you click on that link, your decision letter will open. International students who are admitted should respond to the offer of admission through their online admission letter. After accepting the offer you will see the new link “Request for I-20/DS-2019” appear on your Applicant Status Page. All questions about completing the “Request for I-20/DS-2019” should be directed to the Office for International Students and Scholars. You must provide proof of an earned U.S. equivalent bachelor’s degree prior to beginning your coursework at the University of Delaware. Proof of this University level bachelor’s degree can be in the form of a copy of the final diploma listing the original degree title and date the degree was earned that has been certified by the granting University and then mailed directly from the Records Office of that University. Proof submitted in any other way will be at the discretion of the graduate admissions staff as to whether it can be considered official upon arrival and inspection. If proof of degree is not issued in English directly by the institution, then the applicant must provide a notarized translation of the earned degree. You must provide an academic record listing every course taken at the University level. Academic records must be issued and mailed directly from the Records Office of the issuing University. Proof of academic records submitted in any other way will be at the discretion of the graduate admissions staff as to whether it can be considered official upon arrival and inspection. If your academic records are issued in a language other than English a literal word-for-word English translation must be provided as an addition to the original language. Fraudulent Documents – The Office of Graduate and Professional Education will call into question the veracity of any document submitted to our office. We regularly verify transcripts with the issuing institution. If any material is found to have been altered or falsified we reserve the right of expulsion. Graduate and Professional Education is located in Hullihen Hall, the UD's main administrative building. It is part of UD's main campus and is in Newark ("New Ark"), which offers the charm of a small college town, with easy access to major metropolitan areas. UD also has campuses in Wilmington, Dover, Georgetown, and Lewes, Del. The University of Delaware campus is located in Newark, Delaware. You will need to make arrangements to travel from the airport to campus when you arrive in the U.S. Here are a list of area lodgings that are within a five-fifteen minute drive of the University. AMTRAK and SEPTA operates a vast network of fixed route services including bus, subway/elevated, trackless trolley, light rail, and commuter rail serving a 2,200 square mile service region. Bus services at UD includes UD Bus Shuttle, Newark Unicity Bus System, DART (Delaware Transit Corporation) and Greyhound. If you’re looking for temporary or permanent housing or just guidance on how to sign a housing agreement explore this resource for more information.